YORBA LINDA, CA – It seems odd, with the current state of global politics and exceedingly high oil prices, that someone would think it more profitable to trade crude oil for green grass. This glimpse from the 17th green provides a good example of the panoramic vistas you'll see a lot at Black Gold. 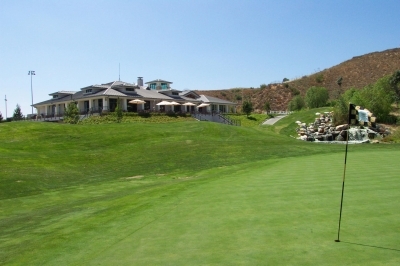 But that’s exactly what they’ve done at Black Gold Golf Club in Yorba Linda, California, and the resulting golf commodity has proved much more valuable than mere gold and silver to local players – it’s a unique public/private partnership that’s benefited the local government and its constituents greater than money ever could. Yorba Linda’s perhaps best known as being the birth and final resting place of President Richard M. Nixon (about 1/2 mile away from the golf club is the Nixon Presidential Library), but now and in the future the city will certainly gain additional notoriety for its riches in Hills – and we’re not just talking about the geological kind. It's all downhill to the par five 4th hole -- rip a good drive and it's definitely reachable in two. That’s true. It took us about an hour and a half on Southern California’s congested freeways to reach Black Gold, but once you’re safely up in those hills, there’s a certain kind of solitude that goes along with it. The morning we played was rather cool and overcast, but on a clear day, we’re told, you can see the ocean from several different spots on the golf course. Click on the banner to book a tee time at Black Gold Golf Club. Lohman left out the south side, which is rapidly being filled in by the Vista Del Verde housing community. The houses were part of the original plan to turn this oil drilling land into living and recreational space. Talk about land reclamation. The houses get close on several of the holes, but one would have to say the whole of the golf experience isn’t touched by them – but then again, heed the signs that say (paraphrasing here) ‘Golfers responsible for property damage caused by stray golf shots.’ Ouch. 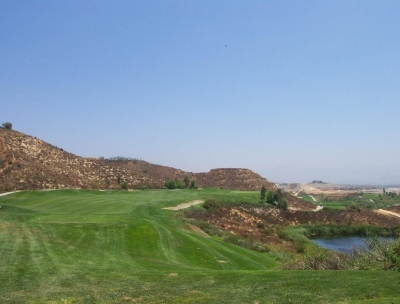 The thinking behind Black Gold began in the early nineties, when AERA Energy, a subsidiary of Shell Oil, decided to donate a large tract of land to the City of Yorba Linda, with the stipulation that the municipality would use the property to build a golf course (the course opened in November of 2001). Meanwhile, the oil company would begin capping the wells, and its real estate arm would develop a housing community on the balance of the land. When the wells begin to run dry, it’s more profitable to sell the land to accommodate the ever-growing population of Southern California. No amount of the true ‘black gold’ can compete with the escalating real estate costs out there, for sure. As always, Arthur Hills has designed an interesting group of par threes at Black Gold. Here, the 16th hole. 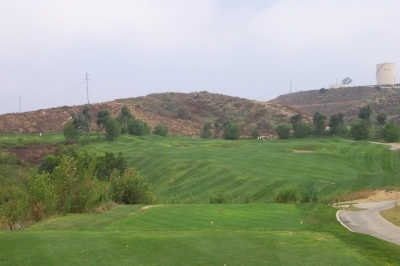 Yorba Linda had always considered building some sort of recreational facility for its residents, so the opportunity to grab this land in exchange for some permitting requirements was certainly an attractive proposition. 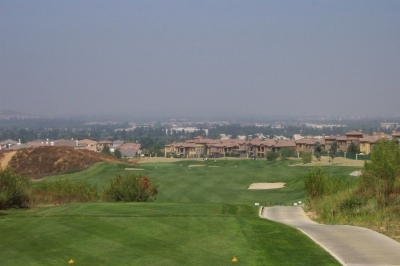 AERA gave up 213 acres to the city, and in came Arthur Hills to plan and build the golf course. What you see now at Black Gold is a course thoughtfully weaving in, out, through and over some steep canyons and deep ravines. Despite the nature of the surrounding terrain, there’s a surprising amount of flat space – and it looks as though it’s always been that way, with plenty of native vegetation bordering the golf property (when we were kids, we used to call them ‘weeds’). It looks like there's lots of room to drive the ball on the par four 2nd hole -- but if you've got some curve on your drive, you might not make the carry. “Just to cut and fill and create plateaus… I mean, we’ve never moved over a million yards of dirt on any other golf course that I can remember. 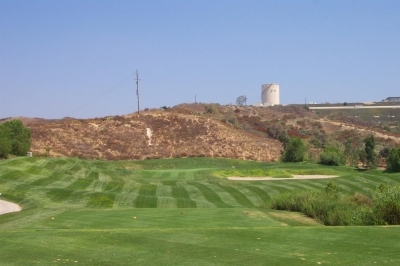 And because of all the cut and fill, we had to do a ton of re-vegetation of the slopes above the golf course,” Hills added. Greenside at the par four 15th hole. It's reasonably short (344 yards), but well bunkered, as you can see. Hills’ estimate of the dirt moved differs somewhat from Lohman’s figure, who said it was closer to two million. We’re not in the business of figuring out how much soil was pushed around the landscape, but one thing’s for sure, it was a lot. Thank god for heavy equipment. All that earth moving, and there were still active oil wells on the site (there still are a couple). Hills said they capped the ones that were actually impacting the property, and the existing layout came very close to at least one of them. Surprisingly, the architect said there weren’t any outstanding environmental issues to deal with – and that’s always a good thing to help move the work along. The 167 yard, par three 7th hole would seem easy, looking at the scorecard -- but it's got one of those subtle moving greens that Hills is fond of designing. Because of the nature of the ground, its total acreage yielded a rather ‘short’ back tee yardage figure, 6,756 yards. Hills said they had to do quite a balancing act to fit the holes in, especially on the tight back nine. He also said that 6,700+ yards is enough for most people in the marketplace: “Most golf courses are perfectly okay, being a little shorter. There’s all the talk about length these days, but only a very few people go out to the extreme yardage anyway. 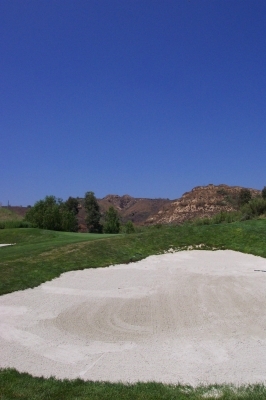 Most people are perfectly happy to play it at 6,200 yards or less,” Hills instructed. 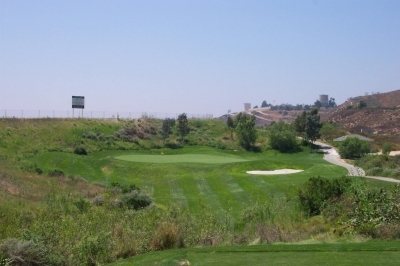 The 12th tee -- the highest point of any golf course in Orange County. Pretty scenery, and a good golf hole, too. The narrow corridors all but alleviate the need to bring and use your driver very often. There are only two par fours over 420 yards, and none over 450 – and the two long holes give a more than adequate landing area off the tee. The par fives are reachable, too, the shortest being 500 yards and the longest stretching out to 535. We’ve found through experience that Hills likes to build in risk-reward opportunities on his par fives, and that’s definitely the case at Black Gold. In back of the flag on the par three 8th hole. You can see the tees in the background -- it's quite a carry, to say the least. And although there’s more than adequate bunkering, you can still get out of it. “The bunkers here aren’t deep-faced, meaning they have grass slopes above the sand. So if someone’s not the best sand player, they’ll still be able, in most cases, to at least get the ball out of the sand onto the grass, where they’re able to chip it. Average players are more comfortable with that type of shot, so it helps keep things moving,” Lohman added. Players will also enjoy the five sets of tees, and the continuous cart path around the course. It makes for a smooth ride, which easily could be a bit bumpy if the paths were more ‘natural’ in form. Anything to aid in pace-of-play on a layout like Black Gold is a definite plus, as there are ample opportunities to slow things down for extended ball searches. The par three 10th hole. No tricks here, just hit the green and make your putt. Hole highlights include the fifth hole, one of the tough par fours described above. Whereas the previous hole is a fairly tame 522-yard par five that plays downhill from the tee, five goes back up a gentle slope the other way – and at 449-yards, it’s a challenge to get it there in regulation. You’ll need to be accurate, too, as there’s a collection of bunkers and hollows guarding the left side of the green. The eighth hole is the second of two consecutive par threes, and it presents quite a spectacular (and intimidating) view from the tee, as the elevated tee boxes call for a near full-carry to the green (220 yards). If you’re just short, you probably won’t lose the ball, but getting up and down will be very difficult. 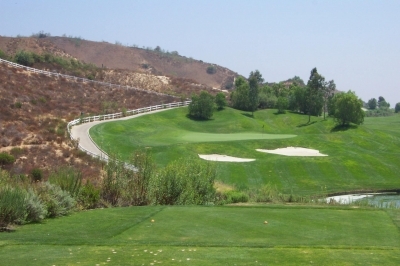 On the back nine, the twelfth hole’s tee box is the highest point of any golf course in Orange County. Admire the view after you’ve hit your tee shot, however, as you’ll need to concentrate to figure out how much of this dogleg right that you want to cut off. A long bunker protects the leg, and you don’t want to go down in there, trust me. Choose correctly, and it’s a mere sand wedge to the green. One hole we didn’t care much for was thirteen, a par five with a ridiculously narrow second-shot landing area – it’s almost best to take the lower percentage ‘go for it’ mentality on the approach, because the alternative isn’t much safer. Hills said they simply ran out of space there, and hopefully in the future, can fix the obvious problems with the golf hole. In back of the 18th green is Black Gold's clubhouse. It's a nice place to hang out after a round of eighteen. Pay you will -- but you’ll also agree it was worth it. 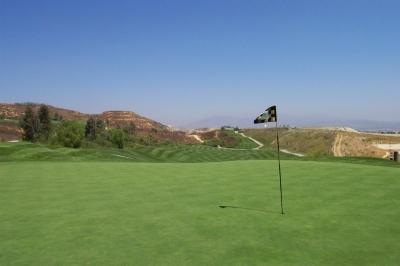 Black Gold is a leading public facility in Southern California, and its interesting history only adds to its appeal. In addition, it’s managed by Kemper Sports, which will ensure the service and facilities are well above par. Try it, and you’ll see why somebody decided to trade oil for golf. 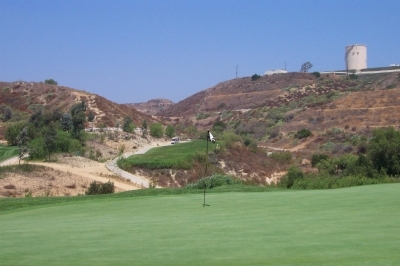 Note: Check the links below for more Southern California golf offerings. $84, M-Th. $94 Fri, and $104 on weekends & holidays. Special rates for Yorba Linda residents. Twilight, Junior and Senior rates also available. Fees include cart, GPS, and range balls. Black Gold has a full function clubhouse and a lighted driving range, as well as a well-established golf academy. It’s also about ten minutes from Disneyland, so when you need a break from Mickey and Goofy, Black Gold might not be a bad place to seek respite.